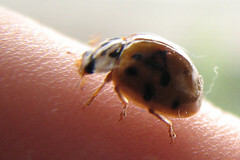 There's a strange attraction that ladybird beetles have for me. They tend to fly towards me, crawl on me. I expect a previous life as an insect. Is this one a step up? More likely, pheromones.